A nightmare that time forgot - and you never will. Steve Alten’s MEG—a tale of a giant, prehistoric shark—was first published in 1997, and various attempts at mounting a film adaptation have been in the works ever since. Everyone from Jan de Bont to Eli Roth to Guillermo del Toro has been attached, and an iteration allegedly starring Jason Statham is due about a year from now. We’ll see. 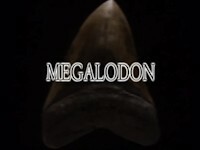 In the meantime, of course, the killer shark genre has become so thoroughly populated that it can already offer multiple riffs on this theme, including 2002’s unimaginatively titled Megalodon, a production that arrived years before this most recent outbreak of ironic shark movies, so it can at least claim to have been made in good faith. You’re not likely to find a more deadly serious attempt at crafting a megalodon movie despite very limited resources. Set aboard a giant oil rig, it finds news reporter Christen Giddings (Leighanne Littrel) conducting an on-site special with oil tycoon Peter Brazier (Robin Sachs) and his crew. After coming under fire from environmentalists, Brazier wants to defend himself and assure the world that his rig is a necessary evil, especially since his critics hypocritically consume oil anyway. That’s a bizarre way to go about things, my dude. Before he can accomplish any of this, however, the rig begins to malfunction as it bores into a fault line on the ocean floor, unleashing various prehistoric species that haven’t surfaced in centuries. Among them is a megalodon shark, which promptly begins to terrorize the rig and its inhabitants. A film whose profundity is matched only by its paucity of budget, Megalodon might represent the worst possible scenario for this genre. You want to respect everyone involved for taking this concept seriously and making a genuine effort, but a lack of skill and budget slowly begins to sink any of the goodwill. A few obviously digital establishing shots of the rig are easy enough to overlook at first, especially since it appears to go out of its way to script some kind of story leading into its killer shark carnage. But as these dull characters carry on with leaden, expository chatter, the seams become much more noticeable and difficult to put out of mind. Simply put: Megalodon rarely provides enough character work or action during its first 40 minutes or so to distract you from how low-rent it is. Even worse, those low-rent qualities can’t even coax a few unintentional laughs to break up the monotony. You sit there, practically drowning in boredom, hoping Megalodon will toss you something to grab onto and stay afloat. For a brief moment, it offers such hope in the form of a scene where a couple of workers are cleaning out a pipe and dig an odd-looking fish. Assuming it’s safe to handle, one of the guys picks it up, only to have his hand gnawed off by the creature, which is later identified as a baby megalodon by the on-board wildlife hunter (who feels like Sting if he were played by Malcolm McDowell). 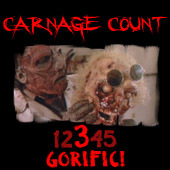 Perhaps the only memory I’ll ever retain of this film is the sight of a gnarly severed hand wound, as it’s the lone moment that lives up to the promise of Gary Tunnicliffe’s billing as co-writer and effects supervisor. It’s also the only time Megalodon feels like it has genuine stakes and consequences: you watch this guy writhe around in pain and his blood squirts from a gruesome, stumpy arm and assume this movie’s finally going to perk up and at least deliver some gruesome carnage to shuttle you off to the finish line. Maybe that’s not the highest aspiration, but it’s an amenable one for a movie titled Megalodon. But alas, you spend the rest of the time wondering just what effects Tunnicliffe actually supervised since it’s a mess of primitive pixels that haven’t aged well in the slightest. Back in 2002, it might have been a bit easier to look past this—after all, everyone was eager to see just how far technology could be pushed, and if there’s any place for such experimentation, it’s when you’re tasked with bringing a killer shark to life. Truthfully, the shark effect here is no worse than the lifeless torpedo from Jaws 3—in fact, it’s probably an improvement over it, which I suppose it should be. Unfortunately, it’s still far from where it needs to be in order to be effective, as it suffers from the same issues as most current shark efforts (which might be more damning for the latter, actually): not only is it completely unconvincing, but it also sticks out like a sore thumb, creating the effect of watching a cartoon interrupt a live action movie. Well, sort of—the truly egregious effects works aren’t confined to the sharks at all, as they go on to infect just about everything else. Let’s be real: we expect the sharks to still look fake in these things (it’s maybe the one prediction Back to the Future 2 actually nailed right on the head). What you perhaps don’t expect is to watch something like Megalodon degenerate into a full-on cartoon. The crew exploits everything at their disposal to fend off the creature, including helicopters and submarines that look woefully inadequate during most shots; in fact, they’re so unconvincing that these sequences feel wholly divorced from the rest of the film. Sure, there are plenty of cutaways and insert shots to remind you about the characters, but Megalodon starts to feel an awful lot like a tech demo that grows out of control, with its directors stretching resources far beyond their means. One especially egregious sequence involving a helicopter crash straight-up looks like a Playstation cut-scene—and by that, I mean the original Playstation. Megalodon would need to have quite the ace up its sleeve to compensate for all of these flaws, and, suffice it to say, it does not. The characters are uniformly dull, including the obligatory Quint knock-off that feels compelled to show off all of his scars (a sight that serves as the second and final impressive gore effect in the entire movie). By the end, we’re apparently supposed to care about the friendship between Christen and her cameraman Jake, but you could have fooled me—these two barely act like they know each other, let alone like each other enough to be best friends. And forgetting the awful effects for a moment, there’s also no sense of drama, pacing, or gravity to any of the spectacle. Some unfold without music, set instead to the hum of chatter and mechanical whirring, meaning the whole thing lands with a thud. The predictably explosive resolution is awkwardly staged, unfolding in perfunctory and incoherent fashion, so much so that I was caught off guard by how anticlimactic it was. I must confess a sense of relief, too, however, as the closest thing Megalodon has to that ace is a final credits sequence that lasts for ten minutes, meaning it actually only clocks in around 80 minutes. I have rarely felt so pleased to be shortchanged.